Introducing hybrid sizing to lift chairs with the new sizes for the popular Golden Cloud! The new PR-510-SME is a hybrid small/medium size designed for people 5’1” to 5’6”. The original Cloud has a new model number: PR-510-MLA, a hybrid medium/large size designed for people 5’7” to 6’2”. - Model number PR-510-SME recommended for people 5’1" to 5’6"
- Model number PR510-MLA recommended for people 5’7" to 6’4"
PR510-SME - Weight Capacity: 375 lbs. PR510-SME - Overall Width: 33.5 in. PR510-SME - Overall Height: 41 in. PR510-SME - Width Between Arms: 18.5 in. PR510-SME - Floor to Top of Seat: 19 in. PR510-SME - Seat Depth: 19.5 in. PR510-SME - Seat to Top of Back: 27 in. 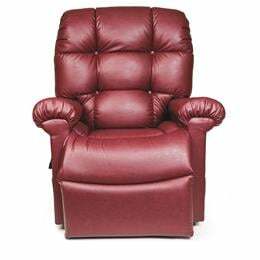 PR510-SME - Distance Required from Wall Reclined: 23 in. PR510-SME - User Height (suggested): 5'1" - 5'6"
PR510-MLA - Weight Capacity: 375 lbs. PR510-MLA - Overall Width: 38 in. PR510-MLA - Overall Height: 45 in. PR510-MLA - Width Between Arms: 20 in. 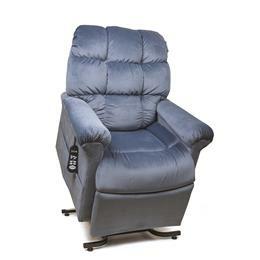 PR510-MLA - Floor to Top of Seat: 20 in. PR510-MLA - Seat Depth: 21.5 in. 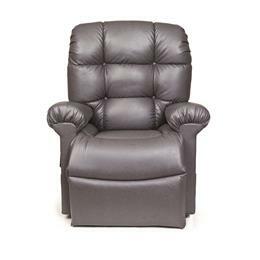 PR510-MLA - Seat to Top of Back: 29 in. 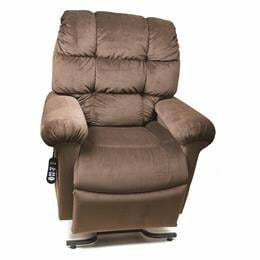 PR510-MLA - Distance Required from Wall Reclined: 24 in. PR510-MLA - User Height (suggested): 5'7" - 6'2"